A variety of processes may eventually cause population extinction once the population has reached a small size or range. The importance of these processes can vary with the size of the population and the characteristics of the species. Many of these processes are stochastic, meaning they are not exactly predictable but occur with a probability that can be known. Others are more predictable or 'deterministic'. The processes can be environmental, demographic, or genetic in nature (Lande 1988). We will deal with these in turn. 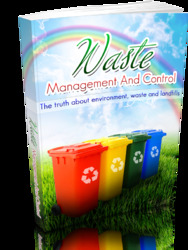 Environmental stochasticity is the name given to unpredictable events that affect all individuals in the population in similar ways. In any given year, for example, weather conditions might promote or reduce reproduction; and biotic agents might favour or hinder survival. In one well-documented case, increases in environmental stochasticity have been strongly implicated in population extinction. The Bay subspecies of Edith's Checkerspot butterfly (Euphydryas editha bayensis) (see Figure 9.4) has recently experienced a number of local population extinctions. This has been linked with increasing variability in rainfall during recent decades. In dry years, the larvae cannot develop sufficiently fast to enter diapause in the summer before their food plants die, and there is massive larval mortality (McLaughlin etal. 2002). Other stochastic events affecting whole populations have been implicated in recent extinctions: the last population of the Heath Hen (a type of grouse once endemic to North America) having been restricted by hunting and habitat destruction to the island of Martha's Vineyard at the turn of the century, experienced a succession of unlucky events, including a drought and fire, and unusually high predation by Goshawks. The population never recovered. The risk of extinction from purely environmental stochasticity can be modelled very simply by describing time to extinction versus population size (carrying capacity) when the average vital rates are drawn at random from a distribution (Lande 1993). 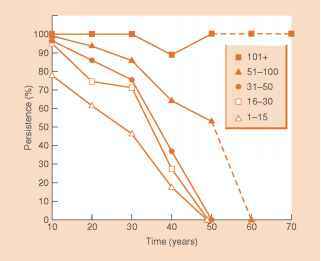 Time to extinction depends on the intrinsic rate of increase of the population, being larger when rate of increase is large, but tends to asymptote with population size (Figure 13.4). Thus, it remains an effective cause of extinction even in moderately sized populations. Demographic stochasticity in contrast is the result of changes in the average vital rates of a population due to differential success of individuals. Some years by chance most of the individuals will be lucky, and at other times unlucky, and these effects can be modelled as sampling variances drawn from a distribution. 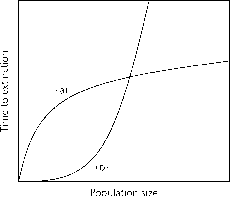 The variance in average rates is inversely proportional to the population size, and so time to extinction rises quickly (exponentially) with population size (Figure 13.4). As a consequence, unlike environmental stochasticity, demographic stochasticity is most important in very small populations. Fig. 13.4 Time to extinction against population size. In (a), the line is asymptotic, so even quite large populations may be at risk. In (b), small populations are at risk, but even medium sized populations are relatively safe. reduces fitness still further. Two typical biological causes are density-dependent mating success, and synergistic social interactions, such as group foraging or defence from predators. The edge effect is a related process that occurs when individuals at the edge of a population experience declining fitness. As the geographic range of a population diminishes, a greater proportion of individuals is near the edge of the range and experience this decline in fitness. In plants a typical cause of this non-genetic decline in fitness is a decline in cross-pollination. In the rare Australian plant Banksia goodii, for example, which grows about 20 cm high, the number of seeds set per plant is positively correlated with population size, with populations covering less than 25 m2 setting no seed at all (Levin 2000). Only about 1000 plants of this species remain and most populations are very small. Fig. 13.5 The Glanville Fritillary butterfly, Melitaea cinxia. Populations on the Aland Islands in Finland are more likely to be inbred if small, and more likely to go extinct if inbred. Photo courtesy of Niclas Fritzen. owls occupy as monogamous pairs in old growth conifer forest in the Pacific North-west. Plans for the conservation of the owl had originally envisaged conserving 500 pairs to maintain sufficient genetic variation (see below). A model based on habitat occupancy, however, showed that 500 pairs were insufficient to halt extinction from demographic causes because colonization of new territories would not balance loss of occupied territories. 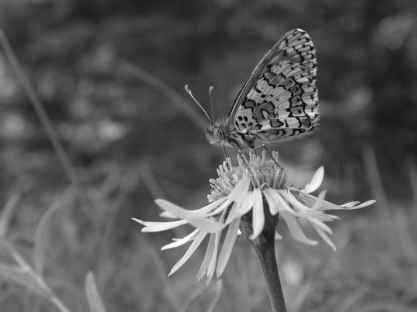 A similar and more recent study on separate metapopulations of Glanville Fritillary butterflies (Figure 13.5) in Finland showed that metapopulations of a few small well separated habitat patches had gone extinct during recent years while larger metapopulations with greater numbers of large proximate habitat patches persisted (Hanski and Ovaskainen 2000) as predicted by a simple model.